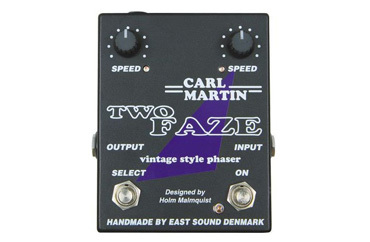 Carl Martin Two Faze is a dual vintage phase shift foot pedal. Designed by Holm Malmquist, to combine the old vintage style phase shifting, with the modern technology's advantages in improved quality in sound and headroom performance. It has two identical but independent sets of speed controls. Each "Phase shifter" has an LED indicator that lights up when in use and also flashes an indication of the speed setting. The Carl Martin Two Faze has a mono input/output via quarter inch jack's. The "on" switch allows you to engage or bypass the Two Faze. The "select" switch allows you to switch between the two Phase settings mid song or mid set without having to get down on your knees to alter the controls. The Carl Martin Two Faze is the perfect choice for guitar and keyboards, or as an excellent effect for bass guitar. It is very rich in sound, it's quiet, and most important of all, does not change the basic sound. The Carl Martin Two Faze has a built in, regulated (+-12V) power supply which enables us to design circuitry of the highest quality with maximum headroom.